He was the premier writer of horror fiction of the first half of the twentieth century, perhaps the major American practitioner of this literary art between the time of Edgar Allan Poe and Stephen King. Born into an upper middle class family in Providence, Rhode Island, Howard Phillips Lovecraft (1890–1937) had a lonely childhood, but read voraciously from his earliest years. He soon became interested in science and astronomy, and began penning stories, poetry, and essays in great profusion, publishing them himself when no other market was available. The advent of Weird Tales in 1923 gave him a small outlet for his work, and he attracted a large number of followers, with whom he exchanged literally tens of thousands of letters, many of them quite lengthy. A number of these young correspondents eventually became professional writers and editors themselves. Lovecraft’s fame began spreading beyond fandom with the publication of his first significant collection, The Outsider and Others, in 1939, two years after his untimely death. S.T. 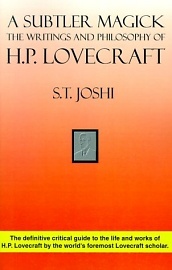 Joshi, generally considered to be the foremost scholar of Lovecraftiana in the modern era, has here produced the definitive critical guide to H.P. Lovecraft’s work. Every aspect of the master’s creative life and work is meticulously researched, examined, and placed in the perspective of his times. Copiously footnoted, A Subtler Magick will become a necessary addition to any student of Lovecraft’s fiction. Complete with Notes, Annotated Primary Bibliography, a comprehensive Annotated Secondary Bibliography, and detailed Index. A Subtler Magick: The Writings and Philosophy of H.P. Lovecraft. By S.T. Joshi. Gillette, NJ: Wildside Press; Third Edition; December 1996; ISBN 1-880448-61-0 (paperback), 316 pages. This book may be purchased in paperback from Amazon.com or Barnes & Noble or directly from the publisher, Wildside Press.